I'll have to use the S8 a lot more to form an opinion about Samsung's latest software. But from the time I spent kicking the tires of some pre-production demo units, I think it's clear that Samsung has made the most feature-rich phone in memory. And it all starts with a really, really big display. 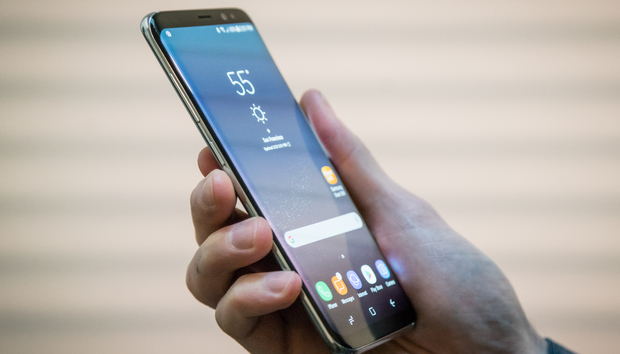 The first thing you’ll notice about the Galaxy S8 is that, while it still looks very Samsung-y thanks to curved sides, it’s basically all display. Samsung calls this new design “infinity display,” and it’s built with the same top-quality Super AMOLED technology used on other recent devices, with support for HDR and wide color gamuts. But just as LG has done with the G6, Samsung dropped the 16:9 aspect ratio most phones use and opted for a taller 18.5:9 ratio display, with only the tiniest bezel above and below (just enough room for the front camera and iris scanner). And, yes, that’s 18.5—I confirmed with Samsung that the resolution is 2960x1440, not 2880x1440 as is the resolution of the LG G6. The new aspect ratio puts a huge display in your hand. The larger 6.2-inch model is shockingly usable. The sides are reminiscent of the Note7, with the left and right edges sloping gently down, and the rear edges curving up to meet them. The result is a very thin, easy-to-grip edge. Combine that with the taller, narrower aspect ratio, and you’ve got a phone that's surprisingly comfortable to hold. More than once while using one of the demo phones, I said to myself, “Now let me try the big one” only to discover that I was already using the big one. If you have an image in your mind of how unwieldy 6-inch phablets have been in the past, you really should try out the big Galaxy S8+ before passing judgement. This is the first phone with the Qualcomm's 10nm Snapdragon 835 in it. Some international versions of the Galaxy S8 will have Samsung’s own Exynos processor (also made with a 10nm process). Is it amazingly fast? We’re at the point where I just can’t tell under normal operation. It feels just as snappy as other modern top-tier phones. Demo units loaded up with a limited selection of apps aren’t really going to show those edge cases where we might see some slowdown, but it felt to me like Samsung did a good job of ironing out some of the hitching and stutters from the latest iteration of TouchWiz... or Grace UX... or whatever they call it now. Interestingly, there’s a Bixby home screen that is summoned when you simply tap the dedicated Bixby button (a press-and-hold is how to give Bixby a voice command), or swipe to the leftmost home screen. This is essentially Samsung’s own version of the Google Now tiles; a list of cards showing you stuff you might be interested in. There’s a weather card, an activity card showing your steps, reminders, notes, suggested YouTube videos... it’s basically an “at a glance” page for your phone. The design is clean and orderly and it might be a great way to get an overview of your phone-based life, but it’s hard to judge on a demo unit. This is the kind of thing you really want your own data to populate before you decide if it’s useful. It already seems like a better feature than the “Briefing” screen (powered by Flipboard) that it replaces. I struggle to think of a phone that does more than the Galaxy S8. There are plenty of phones that have features not found here, like dual rear cameras. But Samsung’s latest has damn near every feature from previous flagships (excepting, obviously, S-Pen stuff). Edge display, Samsung Pay, wireless fast charging (Qi and PMA), fingerprint, iris scanner, fitness stuff, waterproofing, a headphone jack (I can’t believe that’s a feature now), even a premium park of AKG headphones in the box... all with the very latest ultra high-end processor and a crazy-cool giant display.